Roger Hudson describes how the ‘stiffest bridge in the world’ took shape following a railway disaster in 1897. 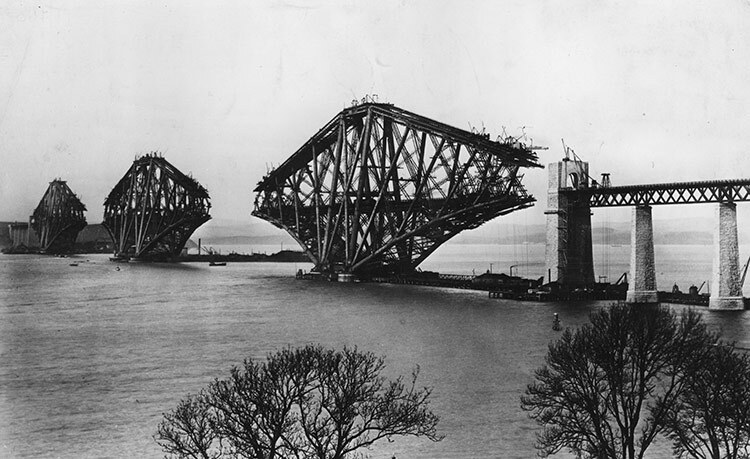 One of the world’s most famous shapes edges towards completion in 1888, although the first train will not cross the Forth Bridge for two more years. It owes its muscular appearance to an engineering tragedy 30 miles or so to the north, when the bridge over the Firth of Tay collapsed in 1879, killing all 73 people on a train that was crossing it during a storm. Parliament cautioned the North British Railway, responsible for the Tay Bridge and now prime mover of the projected Firth of Forth Bridge, that the latter ‘should gain the confidence of the public, and enjoy a reputation of being not only the biggest but also the stiffest bridge in the world’. That is what its designers, John Fowler and Benjamin Baker, aimed for, using novel techniques and materials, so that the main east coast railway line could continue directly northwards from Edinburgh to Dundee, Aberdeen, Perth and beyond. Unlike Tower Bridge, which followed it four years later, dressed up in Gothic trim to complement the neighbouring Tower of London, it left its structure undisguised. This earns it plaudits nowadays for its ‘truth to materials’, though at the time, William Morris called it ‘the supremist specimen of ugliness’. 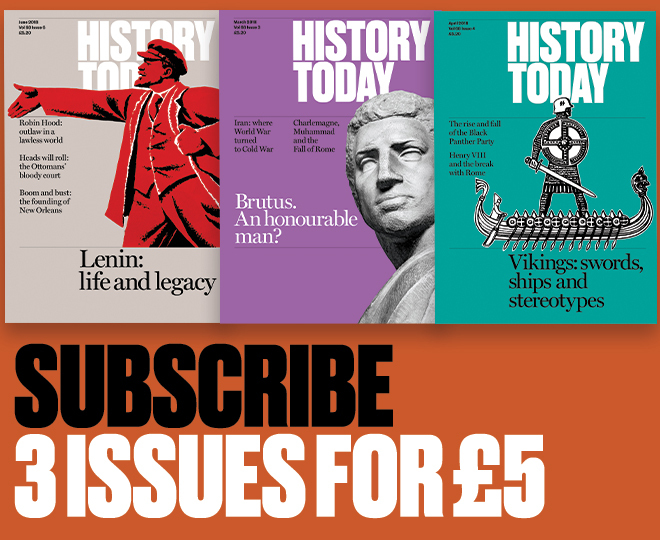 The first Industrial Revolution, based on steam power, cotton and iron, was now superseded by the second, relying on steel, chemicals and electricity, giving birth to the internal combustion engine and radio. It was the strength and flexibility of steel that made possible the massive cantilever construction, with its upper lattice girders in tension and its lower tubular members in compression. In turn, the cantilever principle allowed the growing structure to be self-supporting, so that it did not require temporary ‘falsework’ timbering. Various cranes can be clearly seen on the structure in the photograph, used to hoist up components and supplies from ships and barges beneath. The arms (not yet constructed when this photograph was taken) projecting horizontally from the lozenge-shaped cantilevers were strong enough, 100 unsupported feet out, to accommodate three-ton cranes. Though many rivets had to be fitted by hand, there were also William Arrol’s giant hydraulic riveting machines, supplied from oil-fired rivet-heating furnaces, which could even operate inside the cantilever tubes, some 12 feet in diameter, moving up as the tubes extended. More than 50,000 tons of steel plate was rolled to shape and then held together with eight million rivets. At the busiest time, 4,600 men and boys worked on the bridge, a boy throwing the glowing rivets to each three-man team. There were problems caused by the flexing of the long tubes, by the force of the wind and by the steel expanding as it was heated by the sun: one degree Fahrenheit brought a contraction or expansion of an eighth of an inch. When the temperature reached 60 degrees on the west side on a sunny afternoon, key junction bolts could be inserted there, but bolt holes on the east side only coincided after fires were started inside the tubes. The Prince of Wales hammered home the last gilded rivet in March 1890, but by December there was a Scotland-wide railway strike, precipitated in large part by the extra traffic generated by the bridge causing huge congestion and delays, which greatly added to the hours railwaymen had to work, though they were paid according to the hours scheduled in the published timetables. Only in July 1891 was it agreed to purchase land so the line could be quadrupled either side of Edinburgh’s Waverley Station. The bridge cost £3,227,000 to build, while a 14-year restoration completed in 2011 cost £130,000,000. This included painting it with 250,000 litres of glass-flake epoxy resin as used on North-Sea oil rigs, expected to last at least 20 years and so putting a stop to the bridge being used as a tired simile for any unending job. These figures pale before the 2010 estimate of £2.3 billion for the new replacement road bridge, not yet completed.